Lone workers have traditionally accounted for a small proportion of the working population. However, budget cuts and the promotion of more flexible working practices have dramatically increased the number of personnel that work by themselves for at least some aspect their job. Chris Jones, CEO of PageOne Communications, outlines how the definition of a lone worker is changing and some of the challenges and opportunities affecting organisations. The extent of the budget cuts being implemented to address the deficit has made reductions in headcount an unfortunate, yet unavoidable reality across both the public and private sector. The knock-on effect being that organisations of all types and sizes have been forced to reshuffle existing resources and consolidate roles and responsibilities. The definition of lone worker has often been considered to be ambiguous. Traditionally, the term has been heavily geared towards individuals who work by themselves without close supervision, or mobile workers, working away from their fixed base. However, what is particularly interesting is that as cost efficiencies are being enforced across all sectors, the conventional idea of a lone worker continues to be challenged, and its remit extended even further. For example, cost savings have forced employers to rationalise an existing team into one single job role. Therefore, a switchboard operator within the NHS or retail staff working outside of typical working hours could now be considered a lone worker. In addition to this, many organisations are cutting office costs by downsizing and encouraging more staff to work from home. It’s these changes to the working world that have redefined the term lone worker, and ensured employers address the health, safety and wellbeing of staff at work. With over 160 attacks reported on lone workers in the UK per day, and an estimated figure of 8 million of the UK workforce spending at least half, or their entire time away from their work base, safety has become a huge concern. In the face of crippling cuts, employers must still put in place measures to ensure the safety of their staff. Which is why a number of organisations are now beginning to consider how enhancements to existing technology can fulfil the day-to-day requirements, as well as diverse needs of lone worker personnel. In response to market changes and PageOne’s own customer feedback, PageOne has been developing a suite of products tailored to the lone worker sector. 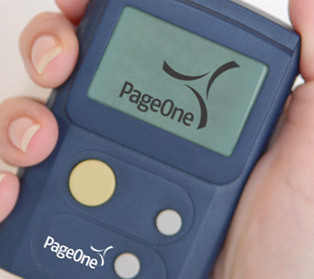 For example, the 2-way Responder device has made a significant impact in this market because it offers reliable 2-way communication with the speed, assurance and reach of traditional paging coupled with the capacity to acknowledge and respond to paging broadcasts. More importantly, the technology embedded within the Responder also supports an emergency SOS button and GPS-based location tracking. So, with a single button press, an SOS alert can be generated and a map showing the individuals location instantly visible for action to be taken. In other instances, organisations are also looking at how technology already allocated to staff can be utilised to meet this need. Which is why PageOne has built on some of the tried and tested features from our 2-way Responder, and developed a more extensive application for Smart Phone devices. Taking the Blackberry for example, we can offer our customers a lone worker application that sits within their current mobile device. Activation and deactivation of the lone worker status can be either driven by the handset holder or the administrator within the command and control centre. The beauty of this means that the device can instantaneously switch from a regular mobile phone, to an all-encompassing lone worker device. The Smart Phone application features a fully functional SOS alert, which can be forwarded to a mobile phone, smart distribution list, email, or a secure online dashboard for further action. For a great number of organisations the cost of investing in lone working systems and processes is no longer prohibitive. Rather, mobile applications that extend the functionality of employees’ existing handsets – and remove the need for investment in dedicated hardware – could be the cost-effective solution for fulfilling the staff duty of care they are looking for. If you are interested in discussing any of the issues raised in this article with a member of our team, contact us today or take a look at our advanced 2-way Responder Pager.